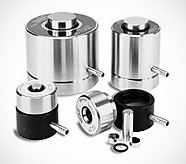 Each die is supplied with two stainless steel pellets and a knock-out ring for easy sample extraction. For hard, corrosive, or irregular shaped samples which need pressing, tungsten carbide pellets are recommended and are available for each die size. SCP SCIENCE recommends using AluCAPs as a backing medium. Replacement stainless steel and tungsten carbide pellets are also available separately and sold in sets of two.